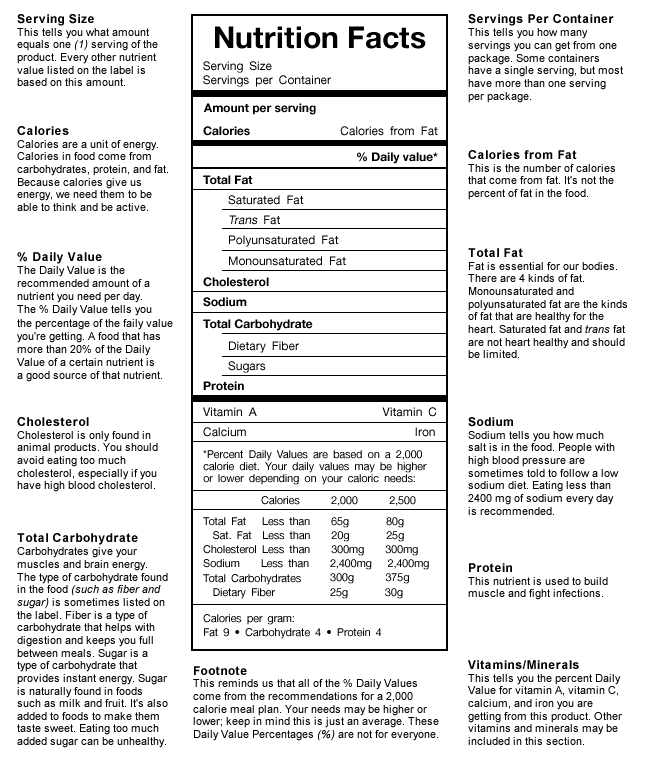 The nutrition facts label gives you information about the nutrients contained in that food. An important fact on the label is the serving size. The food label is based on a 2000-calorie diet, but many teens need more calories and some need less. The Nutrition Facts Label explains what nutrients (components of food your body needs to grow and stay healthy) and how much of those nutrients are found in one serving of the food. The label is found on the outside of most food packages, but isn’t on most fresh foods (such as fruits and vegetables or meats). 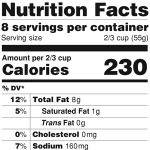 The Nutrition Facts label can help you make choices about the food you eat. Calories (total):Calories are a unit of energy that come from carbohydrates, protein and fat. Calories give us energy so we can think and be active. Calories from Fat: This number is the amount of calories that come from fat. It’s not the percent of fat in the food.% Daily Value: This value is the percentage of the recommended daily value for a nutrient that you get in one serving. A food that has more than 20% of the Daily Value of a nutrient is an “excellent” source; however, for some nutrients such as fat, sodium, and cholesterol, the lower the percent, the better. Total Fat: Fat is essential for our bodies. It keeps us full after meals and helps us absorb certain vitamins. Cholesterol: Cholesterol is a substance found only in animal products. Your body needs some cholesterol to make certain hormones and absorb Vitamin D. While cholesterol is found in some foods, our bodies also naturally make it and the levels can depend a lot on genetics. Eat foods high in cholesterol in moderation. Total Carbohydrate: Carbohydrates provide your muscles and brain with energy. Protein: This nutrient is used to build muscle and fight infections. It also helps you feel full after you eat. Iron: found in protein foods. If we have low iron, we might start to feel tired even just walking around. The first thing you should look at is the serving size. The amount of each nutrient listed on the label tells you what’s found in one serving of that food, not in the whole container. It also is important to look at fiber, especially for grains like bread and crackers. For these foods, aim to buy products that have 3g or more of fiber, because fiber will keep you full between meals and snacks. No. You don’t need to keep track of every nutrient you are eating. Just looking at food labels even occasionally can help you choose foods that will give your body the nutrition it needs. For example, if you don’t drink much milk, you should read Nutrition Facts Labels to help you find foods that are high in calcium or vitamin D. You can also use the Nutrition Facts Label to compare two different foods. For example, if you are deciding between two different kinds of breads, looking at the labels for fiber can help you make a healthy choice. The food label lists a 2000-calorie diet. Should I be eating 2000 calories? Probably not. Many adolescents need more than 2000 calories as they grow in height, build bones, build muscles and stay active. The 2000-calorie diet is just an estimate and is used to help calculate the Percent (%) Daily Value listed on the food label. An Example of a Food Label you might see.